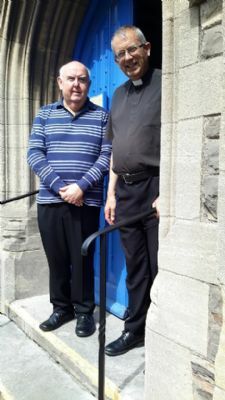 On this page you can find out about the proposals to re-order our buildings in order to better serve our Parish community, and make St Andrews more welcoming so that we can invite more people into our Church. We are grateful to Richard Bryant from TDBC who has confirmed that £5,000 has been earmarked towards our building project. Our thanks also to councillor Marcia Hill and the other councillors who supported and agreed that our Bid should be accepted. Jo Hibbert for presenting us with proposals for the development of the Narthex area. 13th March 2018 - Meeting with our architect Jo Hibbert who brought final drawings for the toilet extension. Drawings have been submitted to Taunton Deane Borough Council for approval. Following this, they will be submitted to the DAC for their approval also. 3rd April 2018 - Installation of two handrails to the main entrance of the church is shortly to take place, and these will be blessed as part of the Parish Eucharist on Sunday April 22nd. Also on Sunday April 22nd we will be launching a funding appeal towards the cost of the building works. On Sunday 22nd April we dedicated the new handrails on the doors into church. We hope this will make the church more accessible to more people. Many thanks to Ben Horrobin who installed them for us and to all who have contributed to the fundraising. New St Andrews received a very generous donation of £1,150 from the All Churches Trust towards this project. committee discussed the three tenders received for the toilet extension. Agreed to appoint Oakleaf Builders to do the work subject to approval by the DAC. A local history evening - A Travelling Church - Still Moving by well known local historian Dr Robert Dunning held on Tuesday 13 November 2018 in the Church raised £557 in aid of the New St Andrew's Development Fund. Thank you to Bob and all those who supported this very interesting and enjoyable evening. Meeting with Oakleaf Builders, Modus Surveying and Jo Hibbert our architect. Tender reviewed with changes to specification agreed. Revised tender with prices due in January 2019. Fundraising to continue with further Bids to be applied for. August 2017 - For new handrails - Faculty from the Diocese and planning permission from Taunton Deane Borough Council applied for. 20th September 2017 - TDBC has APPROVED the planning application for the new handrails. The documentation is on their website today. We should be on course for our faculty to be discussed at the DAC meeting on 11th October. 12th December 2017 – Faculty granted authorising the supply and fixing of two handrails to main entrance of the church. 12th December 2017 – Official order given to Ben Horrobin to produce and install the handrails.